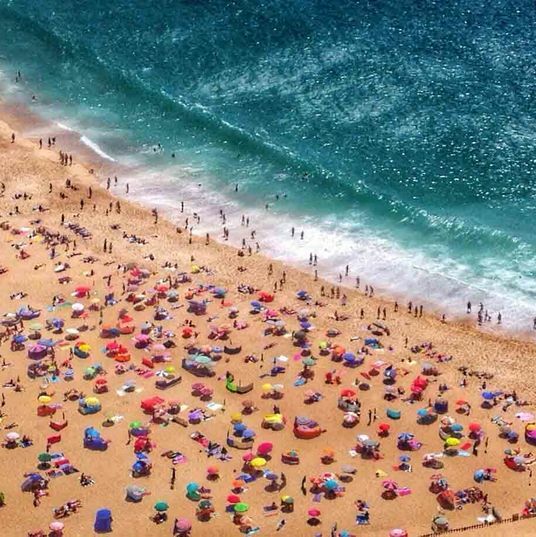 As peaceful and relaxing as a sunny, breezy beach day can be, one aspect none of us look forward to is schlepping all of our stuff down to the sand. 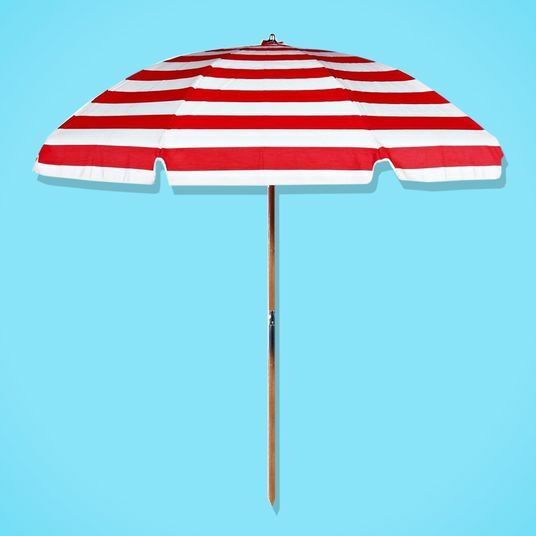 You’ve got your beach chair, towel, and umbrella, not to mention the all-important sunscreen and a good beach read, and now you need something to carry it all. 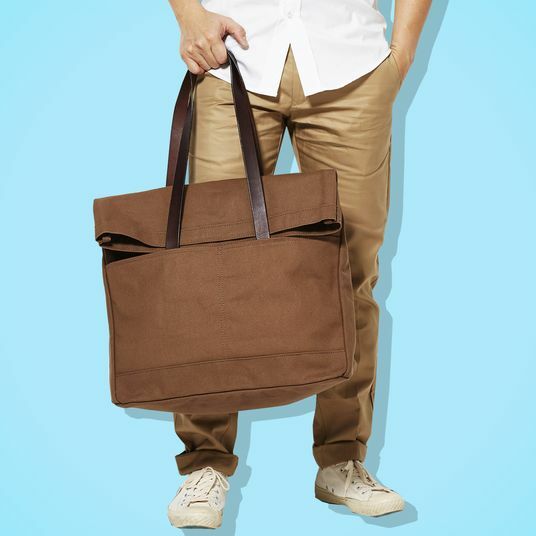 The perfect beach bag should hold all of your necessities and not be a literal pain in the neck to carry. 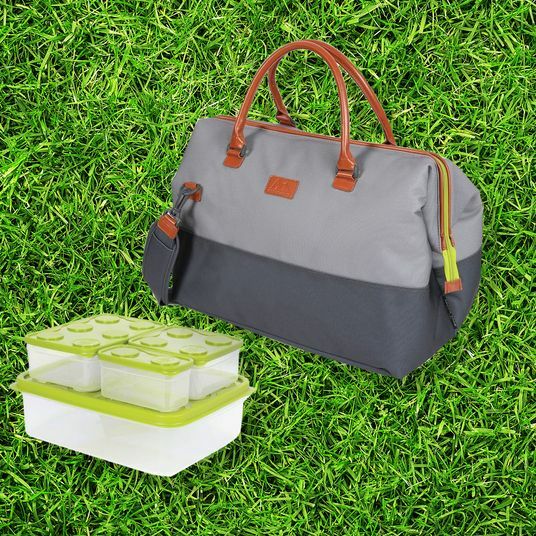 Since it will inevitably get sandy, wet, or covered in lotion from a leaky bottle, it should be made from durable, easy-to-clean materials. 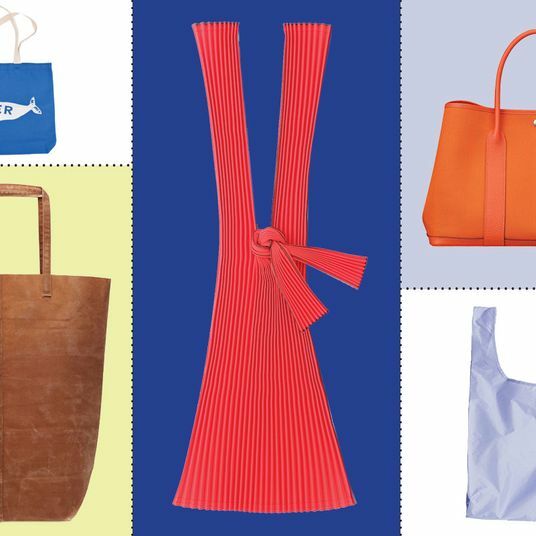 To find out what the pros use, we asked surfers, stand-up paddleboard instructors, and other frequent beachgoers to recommend their favorite bags. Their picks are below. 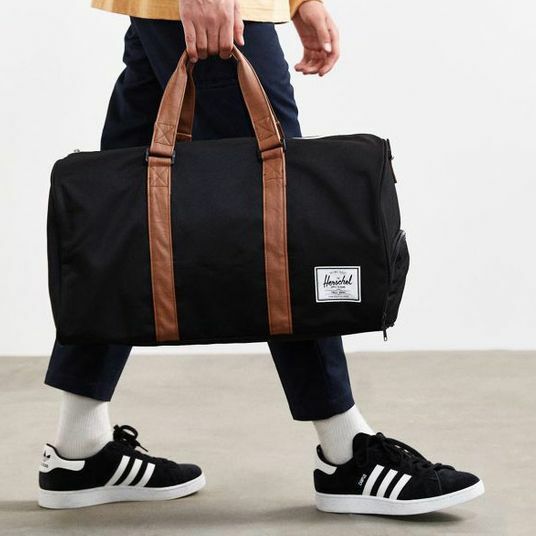 “Since having kids, my theory is the bigger the beach bag, the better,” said Sasha Benz, creative director of the Surf Lodge and a mother of two. 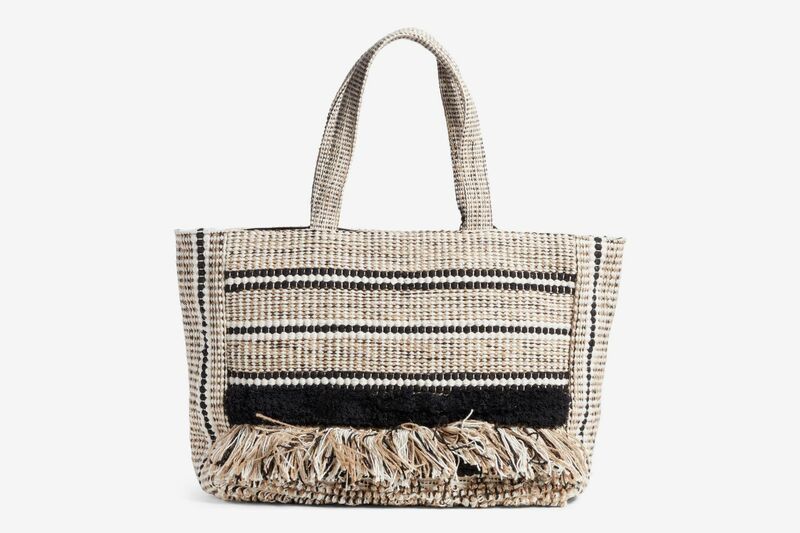 For stashing everything she and the little ones need for a day at the beach, she loves bags from Australian company the Beach People (the ones who kicked off the “roundie” beach-towel craze). 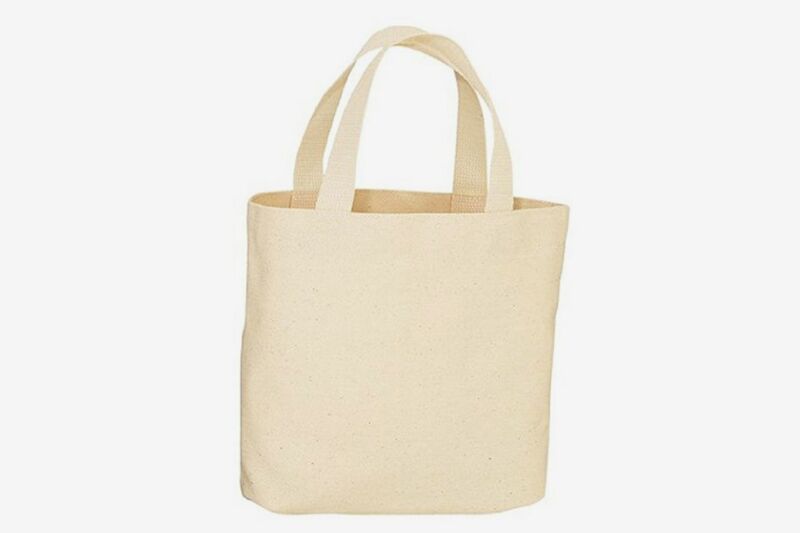 With sturdy leather handles, this open-top jute bag has more than enough room for the whole family’s essentials. 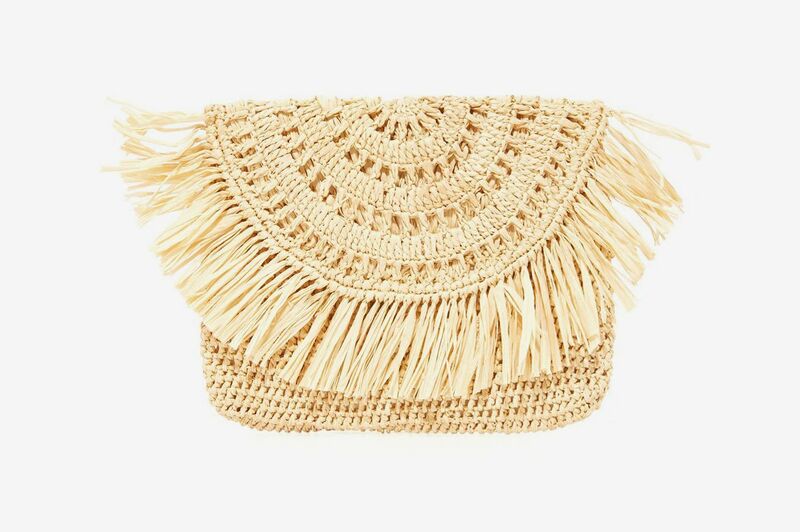 Another roomy bag in durable jute, this woven style has playful fringe and tassel details. 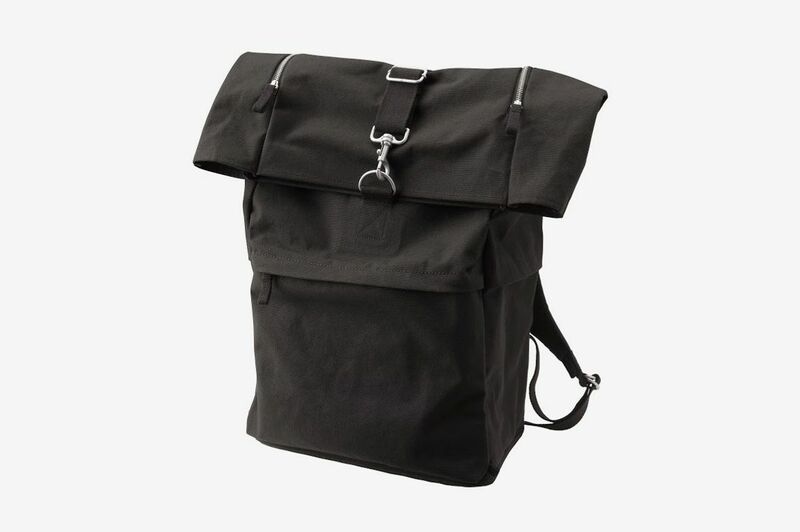 There’s an interior zip pocket for smaller items like lip balm or keys that can get lost in the shuffle of a big bag. 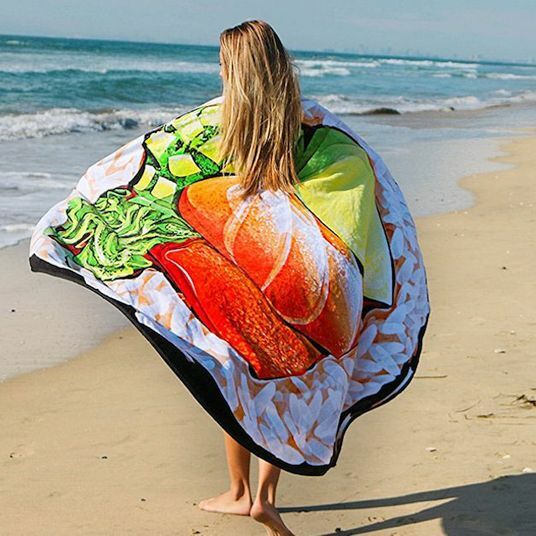 Jessica Bellofatto, owner of JBYoga Studio in East Hampton, can often be found teaching beachside yoga or stand-up paddleboarding. 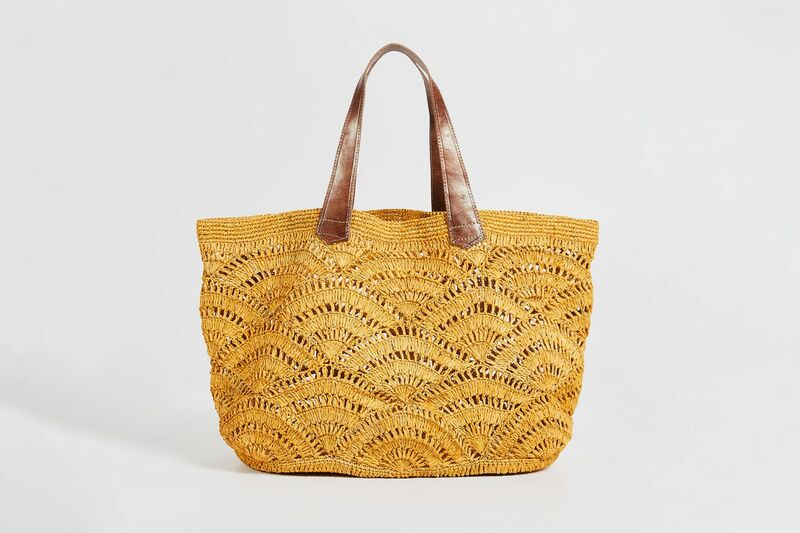 She looks for a beach bag that doesn’t just store her gear, but also aligns with her ecoconscious values, so she loves bags from Mar Y Sol because they’re “made in Madagascar by mostly female artisans out of natural, organic, and sustainable materials.” This sunny, yellow straw tote fits the mood of a long day on the sand. 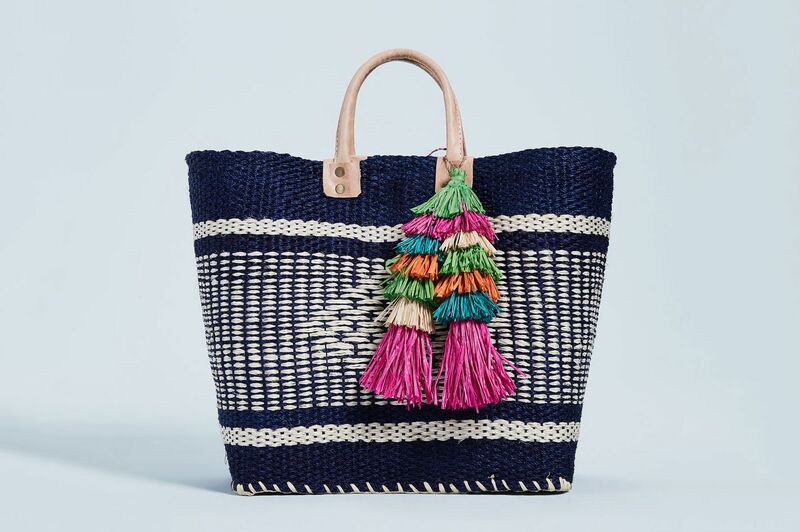 With its bright tassels, this Mar Y Sol bag will be easy to spot in a sea of straw totes. 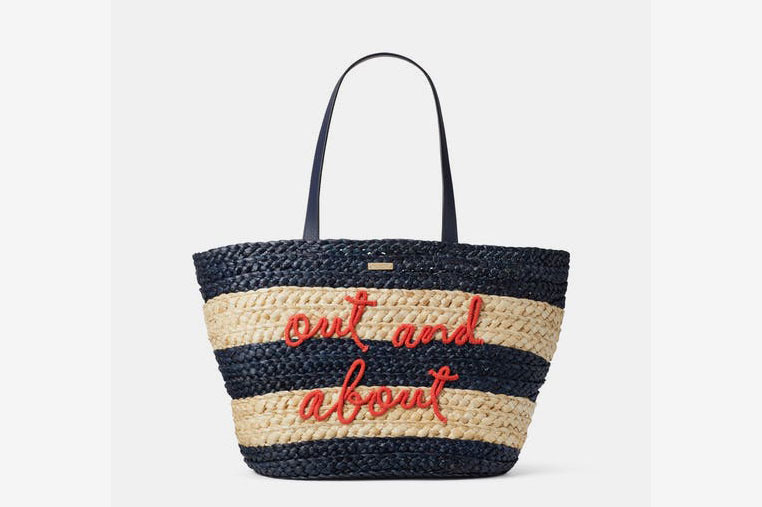 Playful yet ladylike script brings a sense of whimsy to this classic, nautical striped straw bag. 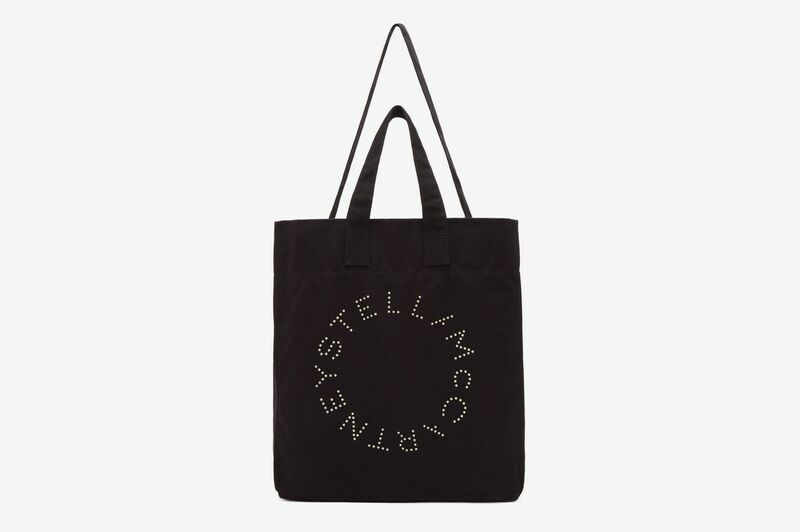 Splitting her time between the city and the Hamptons, Mireya D’Angelo, a SoulCycle senior instructor, uses an older Stella McCartney bag that is no longer available, but we found this very similar recycled canvas one. 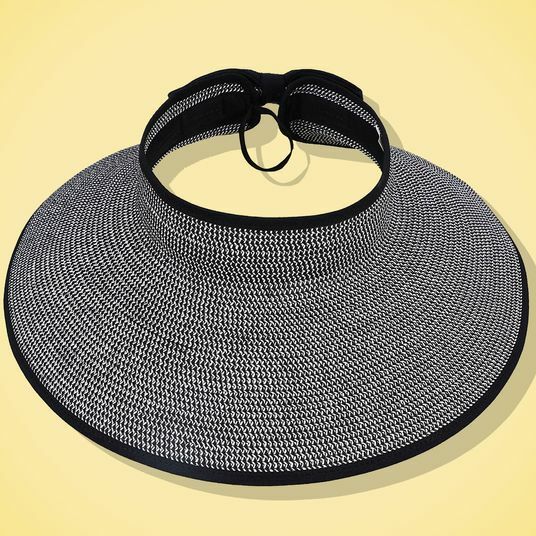 “I can go from the Hampton Jitney to teaching my SoulCycle class, and then straight to the beach since it fits everything I need,” she said. 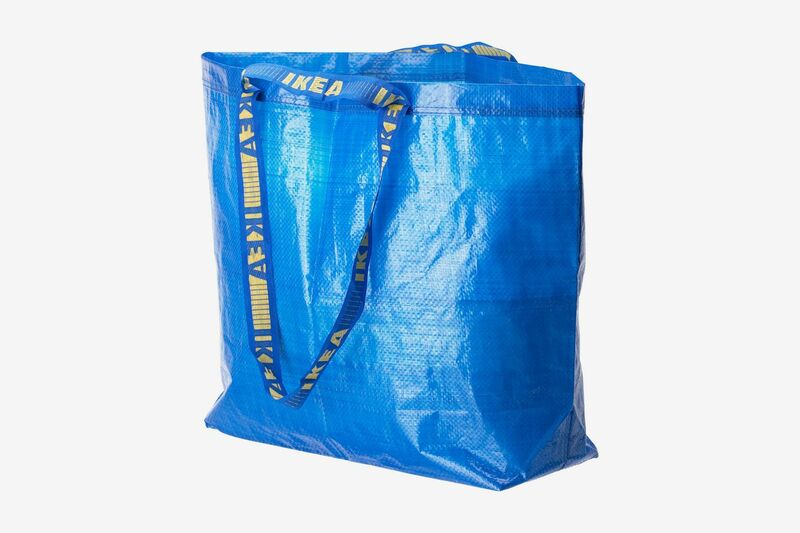 It’s no secret that we’re big fans of Baggu over here, and it turns out they make the favorite beach bag of Mackenzie Kruvant, who manages content and social media for Heyday facial spa. 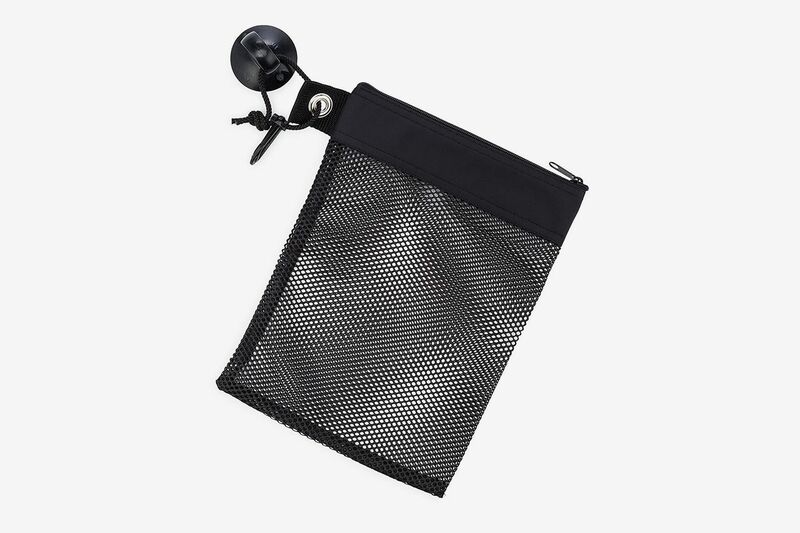 “It has both a shoulder and hand strap, so it’s easy to carry, and a small pocket that can fit my sunglasses and phone, so they don’t fall to the bottom,” she said. 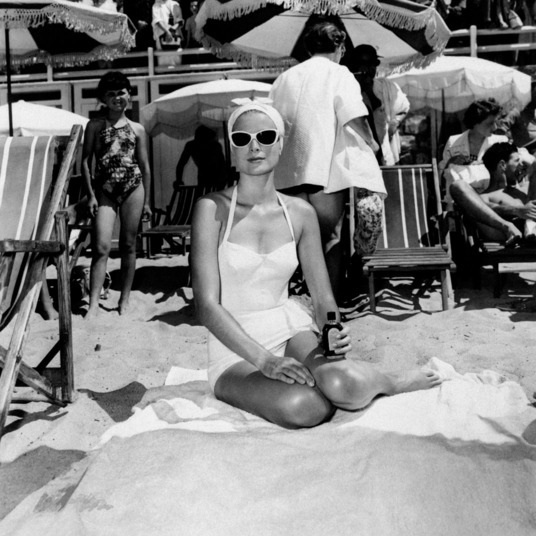 She likes that it has ample room for a towel, a book, and sunscreen. As an added bonus, it’s machine-washable so spilled SPF is NBD. 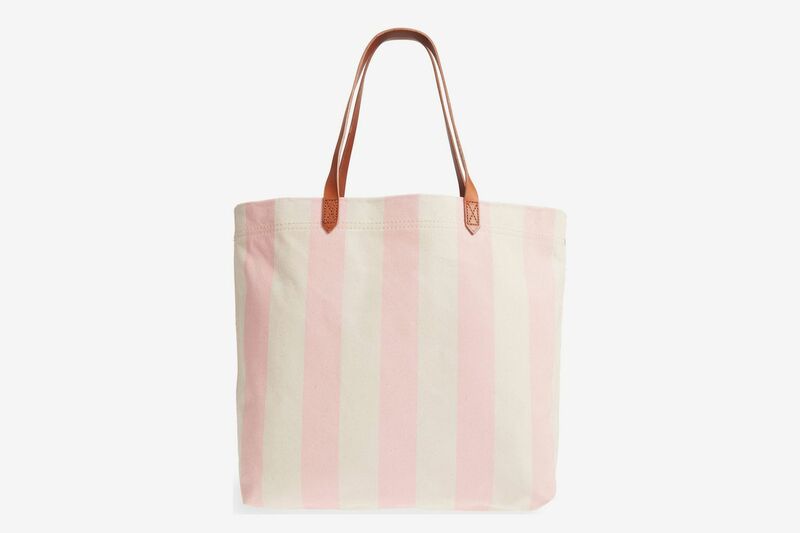 If a leather Madewell transport tote is a staple of your weekday wardrobe, you don’t have to stray far from your comfort zone with this canvas version in summery pink and white. 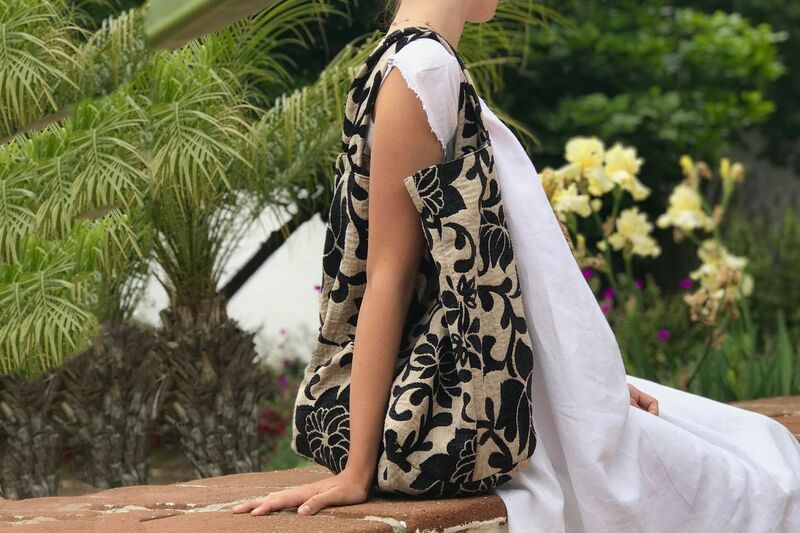 Made in Tulum from vintage upholstery fabrics, this fabric carryall is stylist Carmen Adriana’s beach bag of choice. 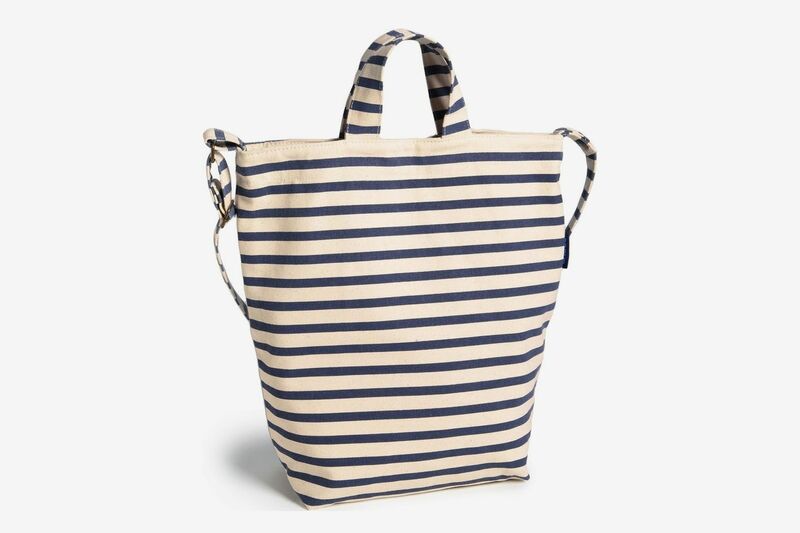 “It’s a great size for fitting all your beach essentials, but stylish enough to carry around town,” she said. 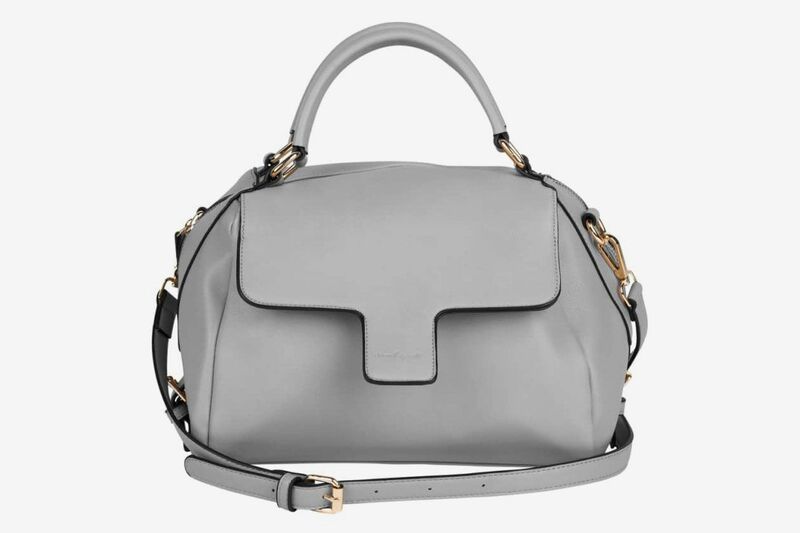 At only $40, it’s also a pretty good deal. 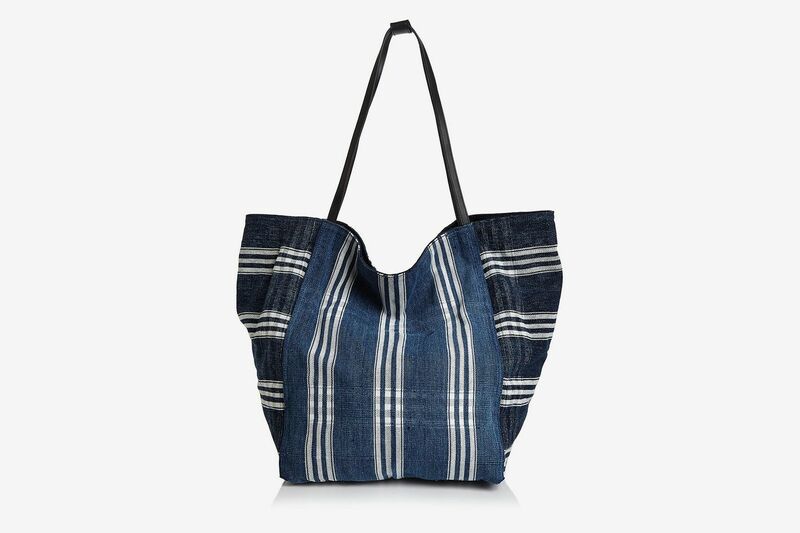 This slouchy, striped bag has enough urban edge for running errands in the city when you can’t make it out to the beach. Hauling gear back and forth to the beach is part of daily life for Gina Bradley, stand-up paddleboard instructor and founder of Paddle Diva. 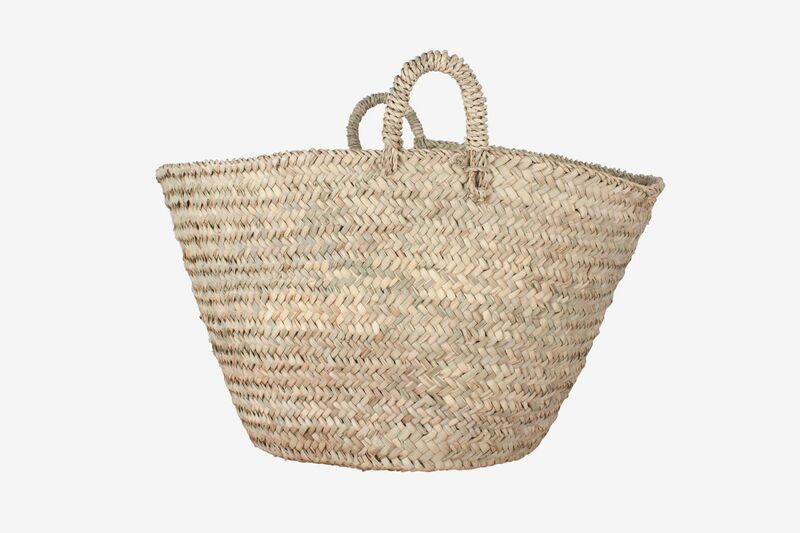 She uses raffia bags from Michelle Farmer, which she finds are both chic and functional. 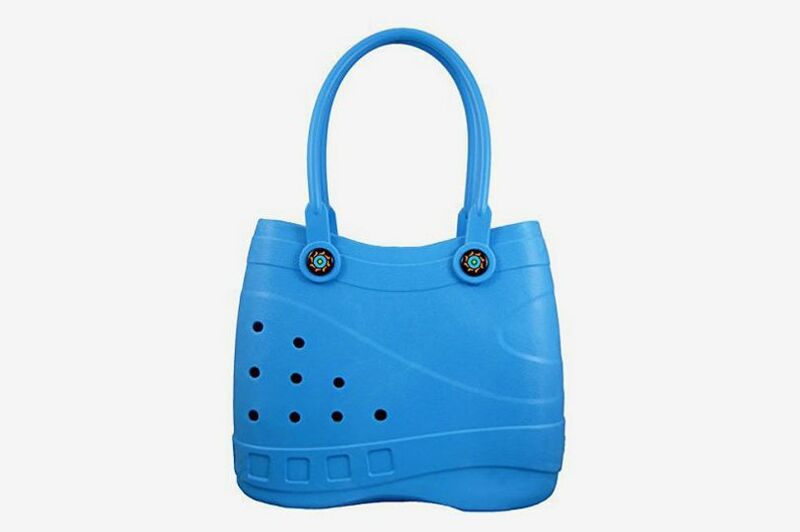 “This bag looks great and is easy to carry on my shoulder while I carry my board or any other beach supplies,” she said. 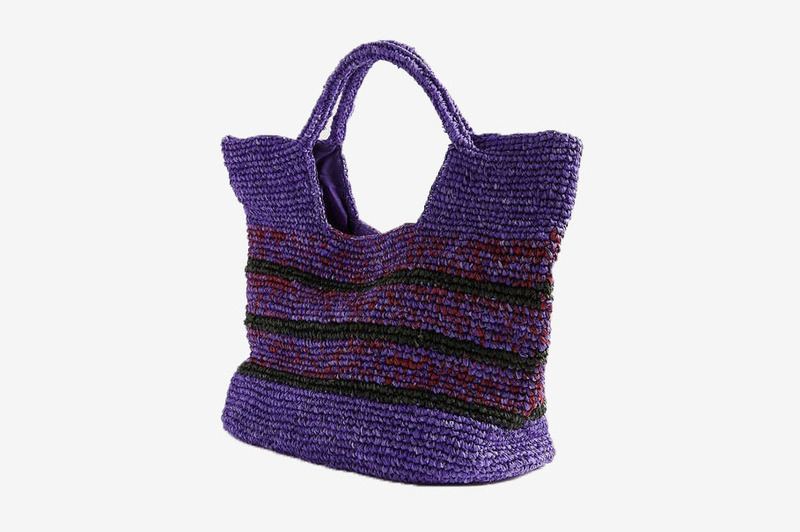 In moody purple — even darker than its melodramatic cousin — this striped raffia bag feels refreshingly unexpected among summer brights. 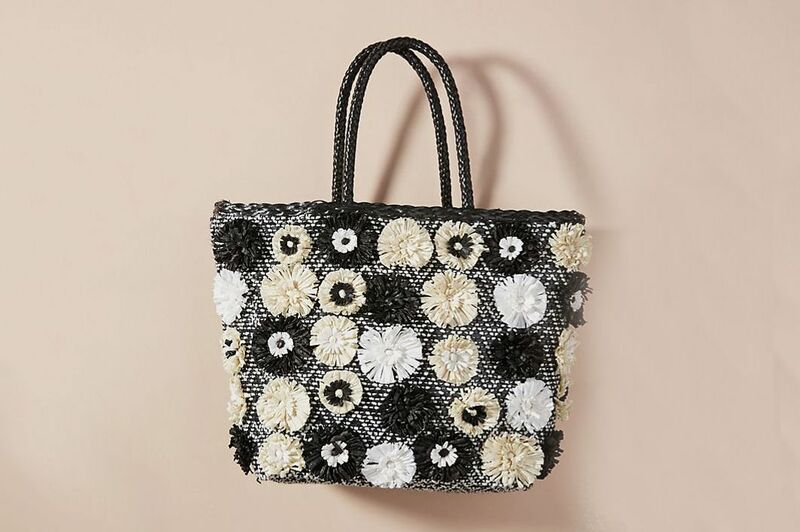 With raffia flowers in muted colors, this black-and-white tote has a hint of sophistication. 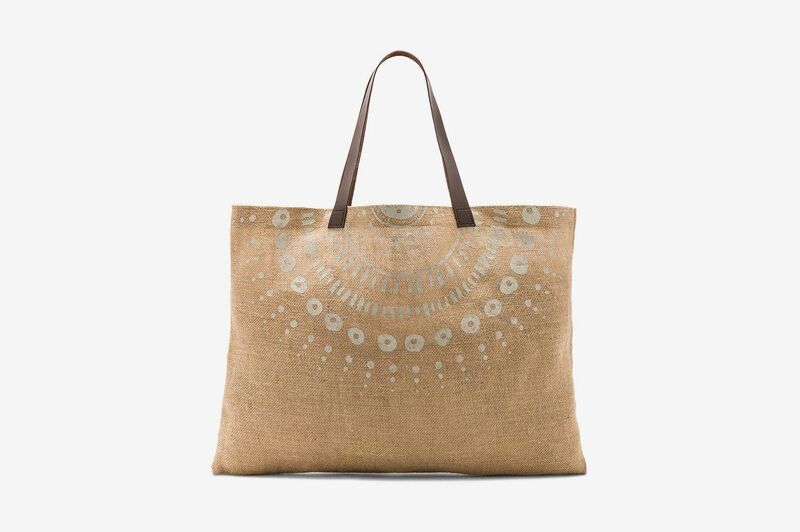 It’s also heavily discounted as part of Anthropologie’s summer sale.